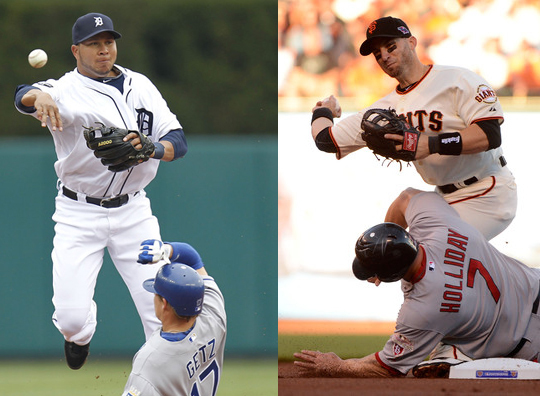 Jhonny Peralta and Marco Scutaro will be playing in the World Series starting Wednesday. The World Series, the biggest stage in professional baseball, kicks off Wednesday. The games will played with a former Buffalo Bison on each side of the field. Recently named to the Bisons ‘All 25 Seasons’ Team shortstop, Jhonny Peralta, will start for the Detroit Tigers. In the other dugout is former Bisons all-around infielder and NLCS MVP, Marco Scutaro representing the San Francisco Giants. Jhonny Peralta was only in Buffalo for 2 years (2003-2004), after being sent down from Cleveland following the return of Omar Vizquel to their lineup. Peralta was named the Bisons’ first International League MVP in more than 40 years during the Herd’s 2004 Championship season. That year, he shattered the single season team record for runs, scoring 109. He also topped all other players in hits and doubles, as well as, averaged .236 batting. That same season, he was also named the Indians’ Minor League Player of the Year. That talented showing lead him back up to the majors and, in 2010, he was traded to Detroit where he plays today. Venezuela native, Marco Scutaro, was a utility infielder for the Bisons from 1997-2000. He averaged .260 for the Herd in 916 at bats with 14 home runs. He bounced around between Buffalo and their Carolina League and Eastern League affiliates over 4 seasons, never making a big name for himself in the minors. He left the team after being traded to the Milwaukee Brewers along with another former Bison, Richie Sexson. Since entering the big leagues in 2002, Scutaro has remained a journeyman, making his way through five MLB teams before landing in San Francisco earlier this season. Both of the former Bisons have shown they can play at a high level in an increasingly competitive league. Both of their teams, as well, have been dominant in the post season and show no signs of slowing down. This should be a very good World Series and even more fun to watch, knowing that two of the stars share roots in Buffalo.